23rd September, Ashgabat: Second-seed Cho Young Seon and Kim Kyung Min won the Men's Doubles gold after defeating top seed, Choi Bok Eum and Kang Hee Won, 434-383 in the all-Korean final match at the 5th Asian Indoor & Martial Arts Games. 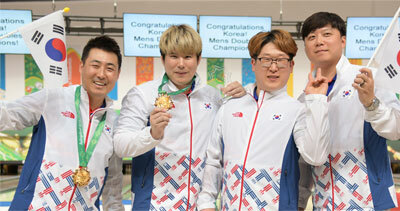 2017 World Games Singles gold medallist, Cho posted 236 and 2015 Men's World Championships Masters gold medallist, Kang added 198 to beat their compatriots by 51 pins. World Championships and Asian Games multiple gold medallist, Choi shot 212 while debutant Kim managed only 171. The champion breezed past fifth-seed, Dhruv Sarda and Shabbir Dhankot of India, 458-365 in the semi-final match to advance to the final while Choi and Kim also had an easy victory over sixth-seed, Wu Siu Hong and Michael Mak of Hong Kong, 449-396 to set up the all-Korean final. Cho and Kang advanced to the semi-finals after edging seventh-seed, Jassim Al-Muraikhi and Ghanim Aboujassoum of Qatar, 389-381 in the quarter-finals. Choi and Kim also easily dispatched eighth-seed, Fachri Ibnu Askar and Diwan Rezaldy of Indonesia, 484-342. Wu and Mak reached the semi-finals with a narrow victory over another Indonesian pair and third-seed, Billy Muhammad Islam and Hardy Rachmadian, 416-415 while Dhruv and Shabbir also edged fourth-seed, Jo-mar Jumapao and Singles silver medallist, Kenneth Chua of Philippines, 418-406 to advance to the semi. In the earlier 6-games prelimiaries, Choi and Kim topped the opening squad with 2847, 340 pins ahead of the Hong Kong pair of Wu and Mak in second. 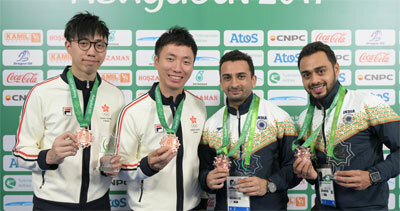 The first Indonesian pair of Fachri and Diwan finished third with 2500. In the stronger second squad preliminaries, Cho and Kang amassed 2783, 40 pins ahead of Billy and Hardy in second. The Filipino pair of Jumapao and Chua finished third with 2662. Two additional pairs of India's Dhruv and Shabbir and Qatar's Jassim and Ghanim took fourth and fifth spots respectively. Three pairs from Squad A and five pairs from Squad B qualified for the quarter-finals shootout. After two events, Korea topped the medal standings with two gold and one silver. Thailand is second with one gold and one bronze medal. Indonesia and Philippines shared third spot with one silver medal each followed by Hong Kong in fourth with two bronze medals. The women will contest their 6-games Doubles event tomorrow. The top 8 pairs will qualify for the quarter-finals shootout. The Team of Four events will be staged on September 25 with the top 4 teams advancing straight to the semi-finals to be held on September 26. The winner of each of the semi-final matches to proceed the final match on September 27.